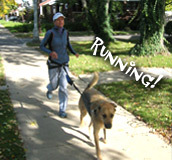 Our family patented this system for those that want to enjoy walking and/or running their dog(s). The individual wears the harness around their hips & buttock. It alleviates the problem of their dog(s) pulling on their back, arms, wrists and shoulders. 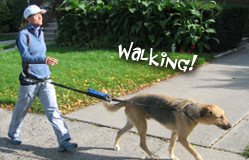 For those with trained dog(s) or those training dog(s), the harness system simply provides the enjoyment of walking and/or running their dog(s) hands-free while obeying leash laws! There is a poop pouch built right on the leash and a 'quick release' to release the leash lead from the harness at a moments notice. Our new harness is made with a quality black mesh making the harness lighter, breathable and fashionably pleasing. We have also added a ring to the back of the harness to conveniently clip the leash lead if your dog(s) prefer to walk/run behind you. 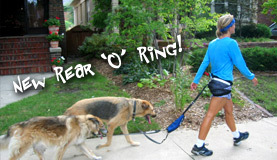 The harness system is ideal for individuals that walk, run, hike, trail run, skijor or canicross with their dog(s) avoiding the need to carry a leash in one hand and a poop scoop in the other!